Fall is known for planting spring flowering bulbs such as tulips and daffodils. According to Rhonda Ferree, Horticulture Educator with University of Illinois Extension, fall is also an excellent time to plant woody plants and some perennials. 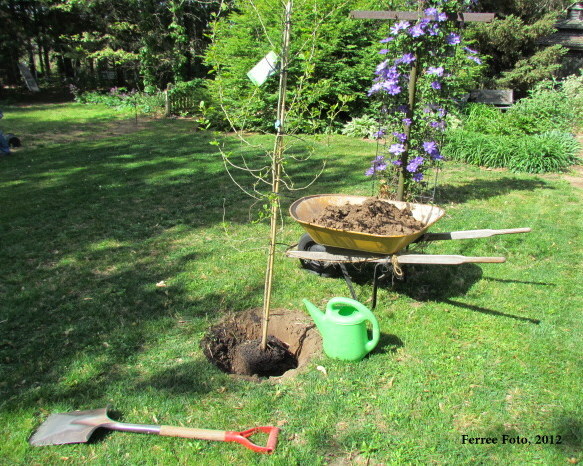 "Most plants prefer a particular season of the year to be moved," says Ferree. Deciduous plants are most easily transplanted in the fall after the leaves turn color or drop but before the soil freezes. Spring is the next best planting time, just before growth begins. Conifers (evergreens) are planted most commonly in early fall or late spring. Some plants prefer spring planting. Broadleaved evergreens (holly and azalea) transplant best as growth begins in spring. According to the Morton Arboretum, some slow to establish trees are also best planted in spring. These include bald cypress, ginkgo, magnolia, hemlock, sweetgum, tulip tree, and willow. Fortunately, many local retailers carry fall planting stock. You might also consider mail order, especially if you have a particular plant in mind. A reputable mail-order company will try to ship plants according to the best planting date for your zone. Shipping dates will be listed in the catalog or on their webpage. Catalogs will often specify if a plant is shipped only at certain times of the year. Some varieties are only shipped in the spring, but most bare root, dormant nursery stock is shipped in either fall or spring. So why does fall planting (late-August through October) work better for many plants? Late summer and fall have the advantage of warm soil to encourage root growth. The shorter and cooler days also decrease the amounts of water lost through leaves (transpiration). The reduced upper plant activity and warm soil give roots a good start. When growth resumes in the spring, there are enough roots to support the upper growth. Clear, crisp days are just around the corner. What could be more satisfying than enjoying those days outdoors, planting a tree for future generations? For more information on this or other horticultural issues, consult the many University of Illinois Extension horticulture webpages at http://web.extension.illinois.edu/state/horticulture.